You don’t need to travel far to feel as if you’re away from the hubbub of the everyday. 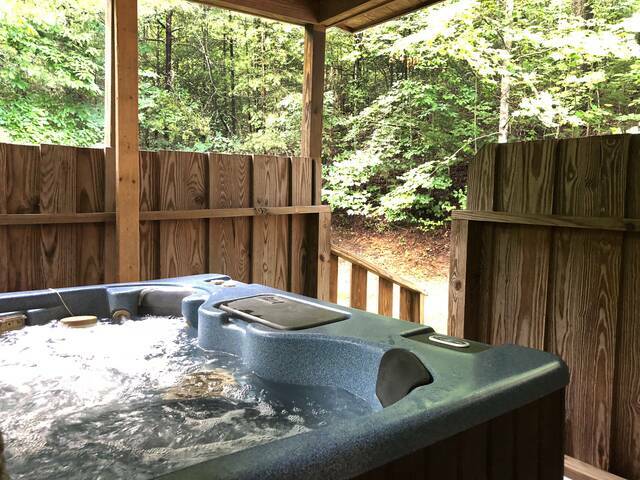 That’s the beauty of Secluded Romance: Thanks to its large master bedroom, jetted tub, this cabin is a cocoon of relaxation, pampering, and serenity, yet it’s only a 10-minute drive from restaurants, shops, and the excitement of downtown Gatlinburg and Pigeon Forge! One reason Secluded Romance feels like a little piece of paradise is its woodlands setting. Whether you’re gazing out a window or lazing on a deck, during the day you’ll see sun-dappled trees,, and feel the gentle caress of the mountain breeze. At night you’ll be able to admire the star-studded sky while crickets chirp and owls hoot. The recently renovated cabin has 1 wrap around deck from which you can glory in the wooded surroundings and sounds. 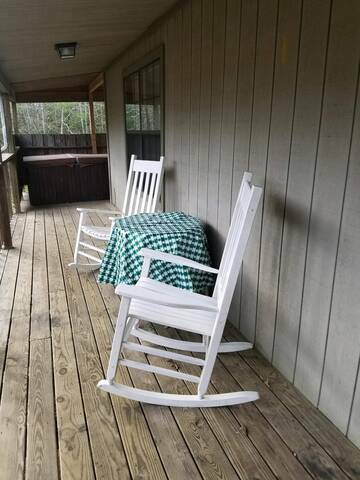 On the deck is a hot tub where you can soak among steamy bubbles or relax in the rocking chairs, a perfect place to start that new book! The kitchen of Secluded Romance has it all. In addition, there’s a charcoal grill outside, to satisfy any hankerings for a barbecue. After dinner, you might want to head to the lofts game room, where you’ll find a pool table! Or maybe you’ll retreat to the bedroom, even if you’re not yet ready for bed. 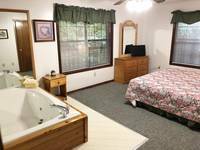 The bedroom is a true haven.The bedroom has, a sumptuous king-size bed, a flat-screen TV, and perhaps best of all, a Jacuzzi large enough for 2. Here’s your chance to spoil yourself and your special someone. When you stay at Secluded Romance you might be tempted to turn in early, stay in bed late, and while away most of the day in the romantic splendor of your bedroom or the deck. And why not? You are on vacation, after all. Should you want to emerge from your private oasis, though, you’ll find plenty to see and do just beyond your door. For instance, you can drive to downtown Gatlinburg or Pigeon Forge in 10 minutes; as well as restaurants and shops, it offers the Guinness World Records Adventure, an aquarium, and a tram that carries you over the town to Ober Gatlinburg Amusement Park and Ski Area. Just as close is the Great Smoky Mountains National Park, with its wildflowers, waterfalls, and wildlife. You could easily spend a day exploring the Gatlinburg Arts & Crafts Loop, an 8-mile trail of studios, galleries, and shops. And Dollywood is less than a 20 minute drive away. 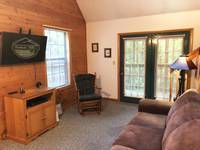 No matter which of the many local attractions you experience, though, there’s a good chance that a highlight of your stay will be simply indulging in the quiet luxuries of Secluded Romance itself—the cabin really is that glorious. See for yourself; book your stay today.